Home Articles Is Jeff Koons a Plagiarist? 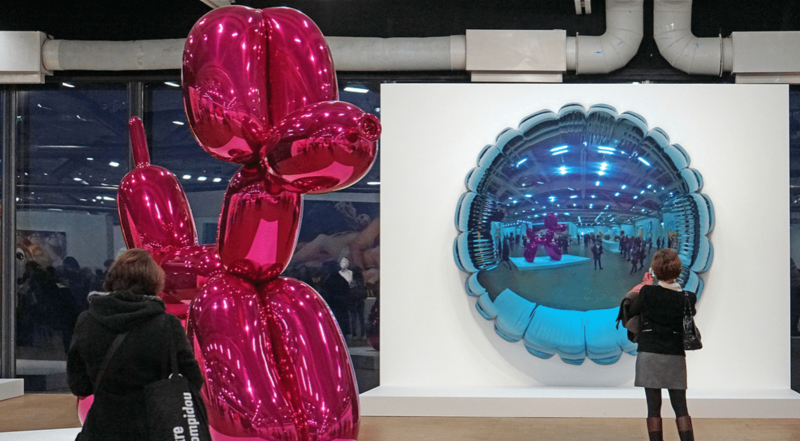 Is Jeff Koons a Plagiarist? The headlines on the internet over the past week have been very clear. 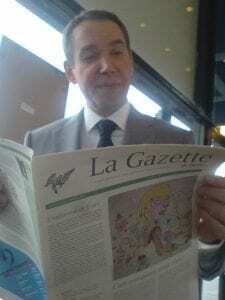 “Jeff Koons is Found Guilty of Plagiarism…” and “French Court Finds Jeff Koons Guilty of Plagiarism” just to name two. The headlines, however, are misleading. Koons has indeed lost a potentially significant court case in France, but it was a civil case, not a criminal one. As such, he is ordered to pay damages and has been found liable, but is not guilty, which implies criminality. Second, he was never sued for plagiarism, instead, he was sued for copyright infringement. Regardless, the implication seems to be pretty clear: The media feels that Jeff Koons is a plagiarist. But is that really the case? Sure, Koons has appropriated the work of others without attribution, but other artists have done similar without being hit with that moniker. To understand we have to first look at what Koons is accused of and then take a look at how that fits in not just with his art, but the art industry as a whole. Quickly, it becomes clear that this isn’t a simple issue and that words like “plagiarism” often have shifting meanings when it comes to appropriation art. The most recent story is actually the conclusion to a four-year-long lawsuit that began in 2014. Then, Koons was sued for copyright infringement by a french ad executive Franck Davidovici. According to Davidovici, Koon’s 1988 sculpture entitled Fait d’Hiver was a copyright infringement of his 1985 ad for the clothing line Naf Naf. 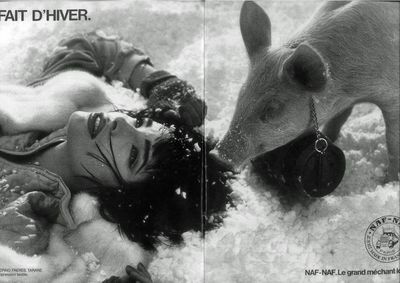 Both the ad and the sculpture shared a title and both featured a woman lying in the snow as a pig delivery brandy tries to help her (similar to the classic image of the rescue dogs in the alps). The case ended this week with a victory for Davidovici. He won some €135,000 ($153,000 USD) in damages for the sculpture itself and smaller awards for the reproduction of the sculpture on Koons’ website and in a book. However, the amount isn’t likely to hurt Koons very much. One of the three editions of the sculpture sold for $4.3 million at auction and the court did not order any of the statues be seized. This is far from Koons’ first brush with copyright. In fact, it’s not his first from this series (the Banality series) in a French court. In 2017 he was found liable for copyright infringement in his sculpture Naked, which was found to infringe a 1975 photograph. However, he’s not the only artist to have multiple brushes with copyright infringement. Still, he’s one of the few that has been widely accused of plagiarism. To understand why, we have to first look at Koons as an artist and then his work. Koons’ work, for most of his career, has involved taking things that are either from pop culture, such as his Michael Jackson and Bubbles statue, or mundane objects, such as his iconic Balloon Dog sculptures, and turning them into art. Like other appropriation artists, this has often put him at odds with copyright. Artist Richard Prince has been repeatedly sued for copyright infringement, so much so that his name and work is often cited in fair use cases in the United States. However, despite being widely hated by photographers, Richard Prince never really faced the widespread accusations of plagiarism. While some certainly feel that he is a plagiarist, news coverage never really applied that label to him. While it would be tempting to blame the current slate of plagiarism headlines on the French wire service Agence France-Presse (AFP), who was one of the first to break the story in English, the truth is it’s been going on for some time. His 2014 lawsuits were called plagiarism cases at the time, college professors have been referring to his case as plagiarism lawsuits for some time and the list goes on. So why is Koons called a plagiarist so regularly? It may come down to his art. One of the key differences between Koons and other appropriation artists, including Richard Prince, is that their art, much to the chagrin of other artists, revels in its appropriation. The appropriation is usually part of the commentary. Prince, for example, mixes work that clear is not his with his alterations to offer commentary not just on the original work, but originality itself. Prince rarely says explicitly where he obtained the work, but he makes it clear what he is commenting on versus what is his commentary. This hasn’t helped him escape the wrath of photographers and artists, who often feel he is making millions selling unlicensed versions of their works, but it has helped him largely escape the moniker of plagiarist. In short, Koons is accused of appropriating a piece of French advertising in a bid to make a comment on American consumerism. Those who viewed the work simply had no idea that Koons did not create the sculpture. He made no attempt, either in the piece itself or in its message, to make his appropriation clear. While Koons has certainly never been shy about his appropriation, in these pieces at least, the appropriation wasn’t part of the message. Coupled with a lack of attribution and a lack of permission, it’s easy to see why many in the art world call him a plagiarist. Appropriation art, by itself, is riddled with controversy. Many consider ALL appropriation art plagiarism and there’s no doubt that the art from pushes the boundaries of both copyright and authorship. That’s very much part of the intent. Regardless about how you feel about it, having an art form that lives in this gray area is imminently useful. It lets us see where the boundaries are. When we understand why Koons is accused of plagiarism but Prince is not, we learn something about authorship and how people view it. Art is meant to help us better understand the world and, sometimes, it does that in unexpected ways. Header image by Jean-Pierre Dalbéra and features Koons’ best-known work, Balloon Dog. Image is licensed under a CC-BY license.